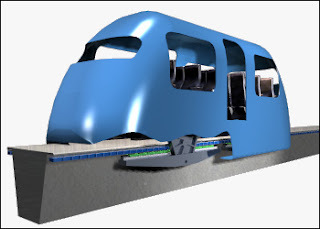 MagneMotion Inc. is an industry leader in the development of magnetic levitation transportation technologies. For a summary on how these objectives are accomplished, please see the paper, Linear Synchronous Motor Propulsion of Small Transit Vehicles, presented by MagneMotion's Dr. Richard Thornton to the 2004 ASME/IEEE Joint Rail Conference. Drones to Replace Human Squadron in Afghanistan? The MQ-9 has got almost all of the tenets of a manned airplane currently deployed, with some advantages, said North. It can stay up longer on a sortie than a manned counterpart like the A-10 ground-attack aircraft or F-15E and F-16 fighter jets. Further, it doesn't cost as much gas to fly them, the general said. And I have got the persistent stare capability. However, it does not carry a gun like its manned counterparts, he said. The Reaper's impact on the battlefield is frankly yet to be determined in a larger scale because the aircraft has only been in combat about six weeks, North said. Yet this is already clear: "As an attack platform, it allows me to do several things, he said. "Number one, I can take and airplane out and fly it for up to 20 hours. I can range the battlespace at more than three times the speed of the Predator. I can carry six munitions on the airplane." "The beauty of it is," he continued, "that when the weapons are gone, you can keep that airplane up for a long time and use it for that persistent stare." Apple has released its first round of Leopard improvements and bug fixes. The OS X 10.5.1 update weighs in at 110MB and can be grabbed through Software Update or directly from the Apple site. Unlike some of its software updates, Apple actually provides a good bit of detail about what’s new in the first Leopard revision. Among the notable fixes is a change in the way the Finder handles moving files to external drives, addressing a nasty bug that could lead to data loss if the transfer was interrupted. For more information, see our earlier coverage. Those of you with mixed OS setups will be happy to know that networking improvements in this Leopard update fix a bug where Windows shared folders would show up as read-only when connected via SMB. Time Machine also gets some import fixes. An issue where files restored using Time Machine would end up in the backup hierarchy rather than the folders to which they belong, has been resolved. Other improvements include fixing issues with the Firewall, Airport, iCal, Mail, Printing and more. The update also includes the security fixes mentioned in our coverage of the Tiger update. 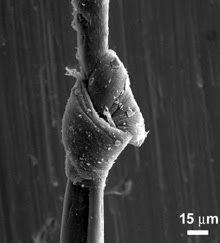 Researchers have developed a process to make carbon-nanotube fibers that are potentially strong enough to stop bullets. Carbon nanotubes spun to form long yarnlike fibers could outperform even the strongest bullet-proof materials on the market, but turning nanotubes into such materials has proved to be a challenge. Now researchers say that they have improved the method of making the fibers: they can pull them from a hot furnace faster, make the nanotubes line up better, and vastly improve their strength. While the carbon-nanotube fibers can still be made only in small batches--and only in short lengths, experts say--the fibers show great promise for ultrastrong, resilient materials, with possible applications from body armor to oil drilling.